Syracuse University Art Galleries, Syracuse, NY. Small artworks by 15 invited artists. The first Artist Laureate for the State of Arkansas. “Look Again: ACM Collection inspires The Boston Printmakers." "Academe, Engravers, and Scenic Routes". "Evan Lindquist: Etching an Identity as a 'Scientific Artist'. By Charles Kaufman. Journal of the Print World, January 2011, volume 34 number 1. Page 7. ISSN: 0737-7436. [illustrations: Thought, Contemplation: Twist of Fate]. Art at the X 2011, Xavier University, Cincinnati. Solo exhibition, Sara Howell Art Gallery, Jonesboro, Arkansas. July 30 - September 30, 2010. Gallery Talk video, YouTube, juror, Jacob Lewis (Director, Pace Prints, Chelsea). October 21, 2010, 6:00-8:30 PM. 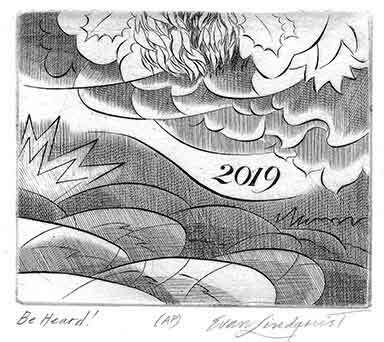 "Works on Paper: Celebrating the Hunterdon Art Museum's Collection"
Prince Street Gallery, 530 West 25th Street, New York City, June 21-July 9, 2011, (Lucas van Leyden Engraves a Feather). Los Angeles Printmaking Society Juried Membership Exhibition, Brea Art Gallery, June 4 - July 15, 2011. (Martin Schöngauer Engraves St. Anthony) (juror: Mike McGee). Los Angeles Printmaking Society 20th National Exhibition, Los Angeles Municipal Art Gallery, October 30-December 29, 2009. (Departures) (juror: Peter Frank). 7th Biennial International Miniature Print Competition, Center for Contemporary Printmaking. Norwalk, CT, May 28-August 15, 2009. (Calligrapher and Surging Sea). (jury: Lisa Hodermarsky, Craig Zammiello). Pressing Matters in Printmaking (Invitational), Southern Highland Craft Guild, Asheville, NC. January 19 - May 18, 2008. (Departures and Succession). (juror: Nikki Josheff). 7th National Print Competition & Exhibition 2008, Janet Turner Print Museum, Chico, CA. January 28 - February 29, 2008. (Departures). (juror: Karen Breuer). 6th Minnesota National Print Biennial 2008, University of Minnesota, Minneapolis. October 7 - November 6, 2008. (Departures). (jury: Stephen Goddard, Betsy Carpenter, Ayanna Moor). Most of Evan Lindquist's prints are engravings, developed from his own original ideas and designs. Using a traditional engraver's burin, he hand-engraves his ideas onto copper plates. He prints the plates in the traditional process of intaglio printing. 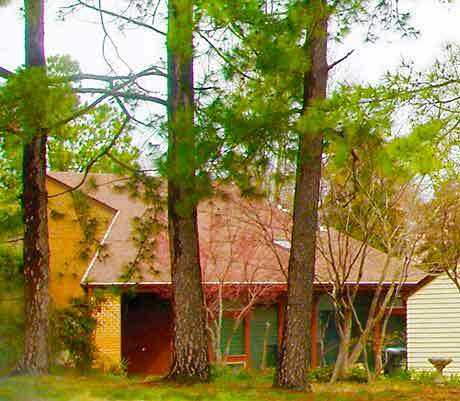 Lindquist works in his private studio (see photos below) in Jonesboro, Arkansas. 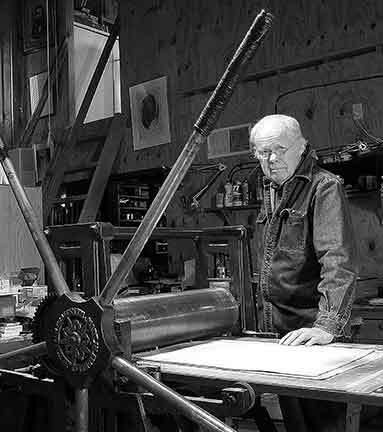 He taught art, printmaking and drawing at Arkansas State University in Jonesboro for forty years and retired from teaching in 2003. 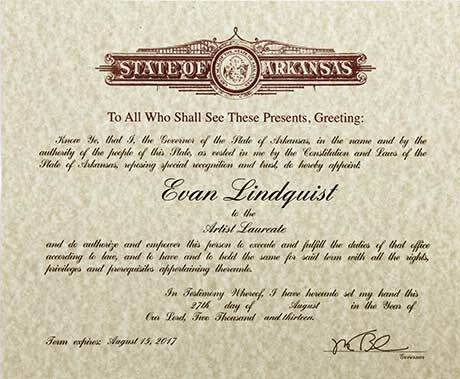 First Artist Laureate for The State of Arkansas. 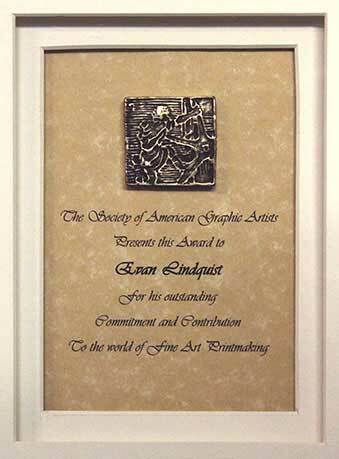 Lifetime Achievement Award, The Society of American Graphic Artists (SAGA), 2010. 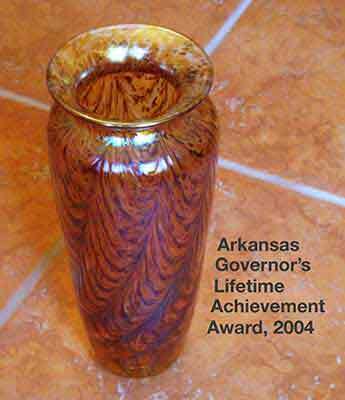 Arkansas Governor’s Lifetime Achievement Award, 2004. 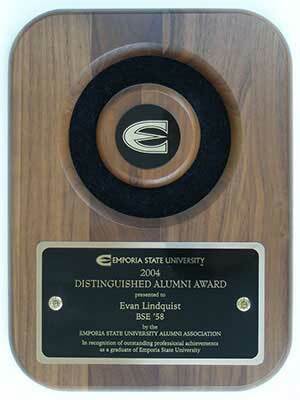 Emporia State University's Distinguished Alumni Award, 2004. 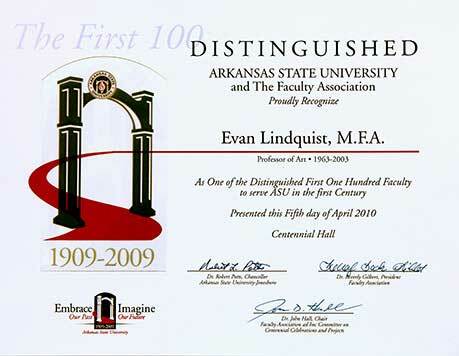 Centennial list, 100 most distinguished faculty, ASU, 1909 - 2009. 100 Years 100 Voices, 100 most significant personalities during first century of Arkansas State University's existence. Outstanding Faculty Member award, Arkansas State University, 1981. First Chairman of the President’s Fellows, Arkansas State University, 1981. Original prints may be seen in many public collections in the United States and other countries. More than 60 solo exhibitions. More than 80 awards in over 300 competitive exhibitions. The Arkansas Arts Center, Little Rock, maintains a traveling exhibition of Lindquist prints available for loan to arts organizations, colleges, universities, libraries, schools, banks, and businesses. He has explored diverse and creative kinds of content, including String Theories, Labyrinths, Academe, Portraits, Documents, Visions, and other themes. [Click here to see the prints] Various works have been described by authors as examples of Satire, Analytical, Metaphysical, and "metaphors of the mind". His process of copper plate engraving derives from ancient techniques used by goldsmiths, armor makers, and artist-printmakers. A few of the celebrated old-master artist-printmakers who used this creative process include Mauricio Lasansky (his teacher), Gabor Peterdi, S.W. Hayter, Albrecht Dürer, Lucas van Leyden, Claude Mellan, William Hogarth, William Blake, Rembrandt, Master of the Playing Cards, Martin Schöngauer, and many others.